Salt is an essential element of good health and it has historically been an significant part of human civilization. True salt has many trace minerals and elements that are vital for a well functioning body. Sadly, the bright white substance in most people salt shakers has been processed into something quite different. 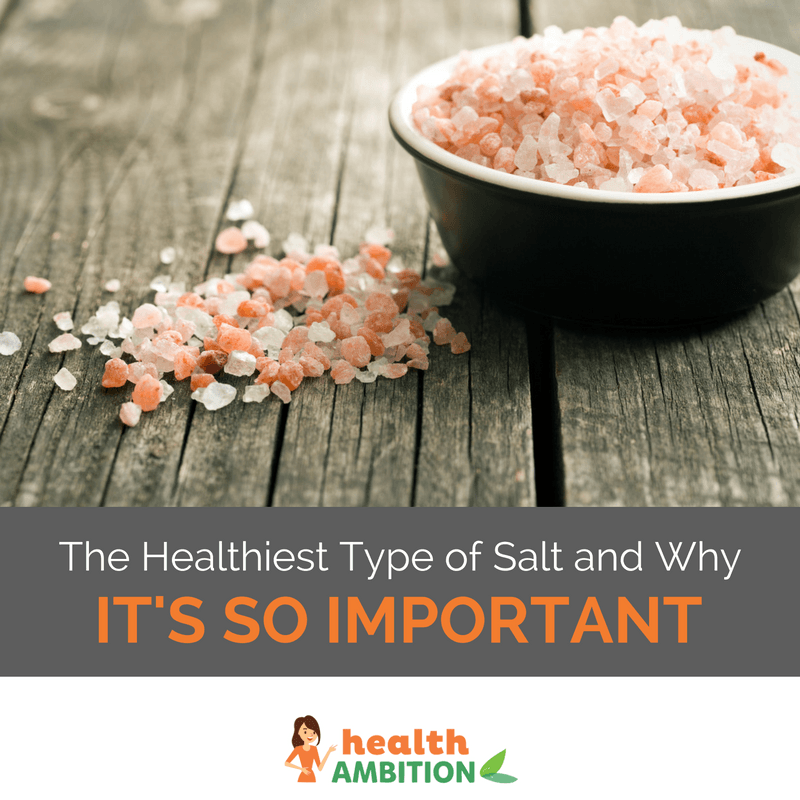 Here is why it’s so important to swap damaging sodium chloride for the healthiest type of salt, the best place to get it and the benefits it can bring to your body. The sodium chloride you buy in the supermarket sold as table salt is actually primarily an industrial product. It is made in large processing plants and over 90% of it is used in commercial industry. During manufacturing it is heated to around 1200 degrees Fahrenheit and treated with caustic soda to remove other minerals. Anti-caking agents, like aluminum hydroxide, are then added to improve how it pours. Unfortunately high levels of aluminum in the diet are now suspected of being a possible cause of Alzheimer’s disease. You can read more about the other side effects of aluminum hydroxide here. When you have this mineral stripped version of salt in your meals, intracellular water is drawn out of your body’s cells to counteract it. This starts a chain of events the puts strain on your kidneys and can, over time, impair their ability to remove waste products from your blood. Longer-term there are many health issues associated with too much sodium chloride in the diet. Let’s have a look at some of the most serious ones. Having too much sodium chloride in your body increases the volume of your blood, leading to high blood pressure. This happens due to the extra intracellular water needed to counteract it. Prolonged high blood pressure may lead to serious cardiovascular problems, kidney failure and many other diseases. Some sodium is essential for proper muscle function and communication within your nervous system. There’s a balance that is needed though and high salt diets can lead to negative effects like muscle cramps, tension, dizziness and disorientation. Eating those salty snacks can alter the sodium to potassium balance in your blood. This reduces the filtering functions of your kidneys and put them under stress. Eventually this can lead to renal disease and painful kidney stones. Proper calcium absorption and utilization can be affected when you consume too much sodium, resulting in porous bones and an increased risk of fractures. Osteoporosis is affecting more and more elderly people with our modern high sodium chloride diets. By reducing your table salt intake now you can help lower your risk of developing this debilitating disease later in life. Excessive sodium chloride can damage your digestive tract, may provoke acid reflux and is a known risk factor for ulcers and gastrointestinal cancers. Drinking more water can help but ideally cut down on foods that are high in processed salt. You feel thirsty after those french fries because the sodium you eat with them is literally drawing water out of your cells and into your tissues. Fluid retention, especially in the lower legs, is often a direct result of having too much table salt in your meals or snacks. Despite all of these health dangers of sodium chloride, you do benefit from some natural salt in your diet. Used in moderation, it should be a rich source of trace minerals that are vital to a well functioning body, even in very small amounts. True sea salt is far better than industrial sodium chloride with aluminium derived anticaking agents. But because the human race has polluted the oceans to such an extent, there is some concern about contaminants, even with real sea salt. The healthiest kind of salt avoids this issue completely. This is because it was laid down millions of years ago when the oceans were unpolluted by man. Himalayan crystal salt is sourced from the deep mines within the Himalayas in large salt crystals. It is a beautiful pink color and contains over 80 essential minerals and trace elements for good health and well-being. Reducing your sodium chloride intake, particularly from processed foods, and replacing damaging table salt with mineral rich pink crystal salt can have some significant health benefits. Here are some of the best of them. Provides essential minerals. So many important cellular processes rely on very small amounts of certain minerals. These trace elements are often processed out of modern food products but Himalayan crystal salt contains up to 84 different types of minerals in their natural form. Improves your body’s pH balance. Real salt helps to remove acidic toxins from your system and can assist in bringing your body’s pH levels back into the normal, slightly alkaline range. Maintains proper intracellular water levels. Being in its natural state, Himalayan crystal salt does not dramatically affect fluid balance in the same way processed sodium chloride does. Switching to this healthiest type of salt is a good step towards better cellular health. Improves nervous system function. The minerals in Himalayan crystal salt increase nerve conductivity and communication, potentially reducing tension and stress within your body. Enhances nutrient absorption. The addition of more trace minerals into your diet helps improve the way you absorb the nutrients in the food you eat. A small pinch of pink crystal salt over your vegetables or in your meals can actually have health benefits, much unlike sodium chloride. Improves muscle function and strength and reduces the incidence of cramps. Real salt is needed for properly working muscles, particularly after exercise or weight training. The more you sweat, the more need you have for real salt. Anti-histamine effect. Himalayan crystal salt is said to be a natural antihistamine and can help clear up lung congestion and excessive mucus. Minimize fluid retention. Replacing sodium chloride with crystal salt should reduce fluid retention and help to prevent varicose veins and swollen ankles and feet. Lessen the chances of developing osteoporosis. In moderation, the mineral content of true salt like this can improve bone density and structure, helping to prevent osteoporosis. Lower the risk of kidney problems and heart disease. Choosing Himalayan crystal salt reduces the burden on your kidneys and cardiovascular system from sodium chloride, leading to better overall health and well-being. Himalayan crystal salt is clearly superior to sodium chloride. I use this fine-grained pink salt and it’s surprisingly inexpensive for how good it is for you. Even the taste of it is much nicer than regular table salt. You can simply pour out the aluminium laced sodium chloride from your salt shaker and replace it with this real and mineral rich salt. It’s one of those simple changes really worth making for better health. Have you made the switch to real salt? I’d be really interested to hear what kind of benefits you’ve noticed and how you’re using it in your daily cooking. Hi there, thank you so much for this great post. I recently wrote a post on the dangers of too much table salt as well. Again thank you and keep up the great work! Thanks for the positive comments Khadija. Is the Sea Salt still a viable substitute for regular table salt? I have seen the Himalayan at our local herb store, just didn’t realize the benefit of it, so thanks for the information. Yes, real sea salt in definitely far superior to processed sodium chloride (table salt). That said, Himalayan crystal salt was laid down millions of years ago before we started polluting the oceans and is known to be high in trace minerals. It’s also quite inexpensive online so I personally think it’s the best option. ƧЄΔ ƧΔ˩Ƭ ƖƧ ҒЯЄЄ. ѦΔƘЄ ƳѲƲЯ ѲƜИ. That’s good to know about the Himalayan Crystal Salt. Just the alkalyzing effect from this type of salt would help fight inflammation which helps to fight diseases. That being said, though, from reading elsewhere as well, although the Himalayan Crystal salt has 84 minerals in it, it still has the sodium chloride. So caution as to the amount should still be used especially for people with high blood pressure. Hi Luanne and thanks for your comment. Yes, Himalayan Crystal salt does have sodium chloride as the primary component, though in it’s natural colloidal form that your body can use. Many experts believe it’s not so much the sodium chloride itself in salt, which is essential in moderate amounts, but rather the processing, bleaching and aluminium and other additives added to table salt that makes it so toxic. There are no salt mines in the Himalayas though so…? If there are no salt mines in the Himalayas, then where is it claimed to be mined??? I think that question should be answered. It’s a fair question, and deserves a truthful answer. It is mined in the Khewra Salt Mines, the second largest salt mine in the world located in Khewra, Jhelum District, Punjab, Pakistan, about 300 km from the Himalayas, about 160 kilometres from Islamabad, and 260 kilometres from Lahore, and in the foothills of the Salt Range. This is from Wikipedia. Take it for what it is worth. just starting to use the pink salt on the advice of my son so it is nice to here how good it is.thanks. ps. is mediterranean flower salt the same.? But they use child labour to get at the salt and simply hack away at the crystals, destroying ancient mountains as they go along. from mines in Pakistan, and it’s purity is dubious. Do some research. ƘѲƧĦЄЯ ƧΔ˩Ƭ ƖƧ ИѲƬ ЄѴЄИ ѦЄИƬƖѲИЄƉ ƖИ ƬĦƖƧ βƖΔƧЄƉ ЯЄƤѲЯƬ.